More than 1 million Americans have already uploaded their genetic information online using public genealogy sites. There’s enough genetic data on family trees that researchers estimate more than half of the people in the U.S. could be identified by name with only a sample of their DNA and a few basic biographical facts, such as their age and where they live. Of the 114 Supreme Court justices in history, 111 have been white and 110 have been male. Every justice seated in the past 30 years received a law degree from Harvard, Columbia, or Yale. 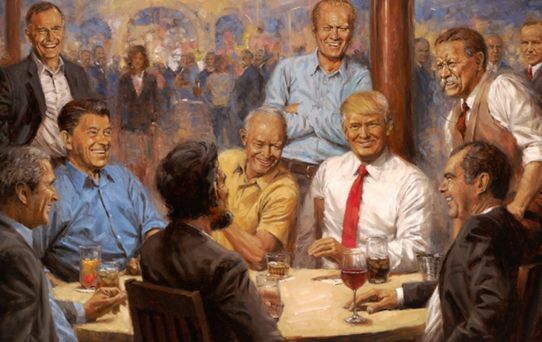 President Trump has hung a painting in the White House depicting him in a cheerful get-together with past Republican presidents, including Ronald Reagan, Richard Nixon, Abraham Lincoln, and Teddy Roosevelt. The painting, by artist Andy Thomas, is called The Republican Club, and prints had been for sale in gift shops. Between 2010 and 2016, the inspector general for the Department of Homeland Security received 84 complaints that Border Patrol and other U.S. Customs and Border Protection officers sexually abused female migrants, including children and teens. The inspector general’s office opened just seven investigations, none of which appears to have resulted in criminal charges. 53% of Americans say Deputy Attorney General Rod Rosenstein should continue overseeing the Russia investigation. 18% think Trump should fire him. 61% view the FBI’s investigation into Russia’s interference in the 2016 election as a serious matter, while 34% see the investigation as a way to discredit Trump’s presidency. Perceptions of aging are shifting, with the average age that Americans consider someone “old” moving to 74, up from 68 in 2009. 72% of retired people say that it is the most liberating time of their lives.